This paper estimates the effect of early lead exposure on academic achievement and adult earnings. We analyze longitudinal information from individuals attending primary and secondary schools in the city of Arica (in northern Chile). Between 1984 and 1989, Arica received more than 20,000 tons of toxic chemicals containing high concentrations of lead. Initially, the chemical waste was located several kilometers from the city. However, Arica's rapid expansion, which included the construction of housing projects just meters away from the waste deposit, put a large number of families at risk. Our data include information on residential proximity to the polluted area, levels of lead exposure, comprehensive demographic information, nationally representative academic test scores and administrative data on adult earnings. We document a strong relationship between blood lead levels and student academic performance. We find that an increase of one microgram of lead per deciliter of blood reduces math and language scores by 0.15 and 0.21 standard deviations, respectively. For earnings, we estimate that for each extra microgram of lead, monthly earnings decrease by CLP 11,458 (or USD 22.92). This translates into a reduction of USD 6,000 in lifetime earnings per microgram of lead per deciliter of blood. 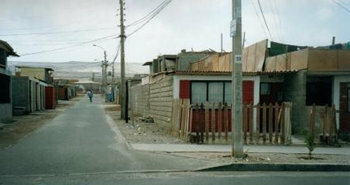 A home in Arica, Chile, near the original dump site.